Millions of years ago, volcanic eruptions in North America were more explosive and may have significantly affected the environment and the global climate. So scientists report in this week's issue of the journal Nature. 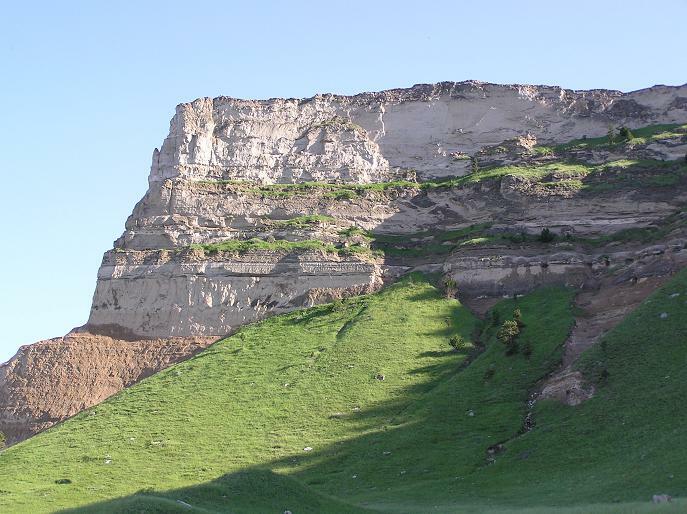 The researchers found the remains--deposited in layers of rocks--of eruptions of volcanoes located on North America's northern high plains that spewed massive amounts of sulfate aerosols into the atmosphere 40 million years ago. The scientists conducted their research at Scotts Bluff National Monument, Neb., and in surrounding areas. "Combining measurements of the sulfate in ancient volcanic ash beds with a detailed atmospheric chemistry model, we found that the long-ago chemistry of volcanic sulfate gases is distinct from that of more modern times," says Huiming Bao, a geologist at Louisiana State University and lead author of the paper. "This is the first example showing that the history of massive volcanic sulfate emissions, and their associated atmospheric conditions in the geologic past, may be retrieved from rock records." Volcanic eruptions may have significant impacts on the environment, Bao says, citing the 1991 Mt. Pinatubo and more recent Iceland volcanic eruptions. "The physical impacts of these eruptions, such as ash plumes, are relatively short-lived, but the chemical consequences of the emitted gases may have long-lasting effects on global climate," says Sonia Esperanca, program director in the National Science Foundation (NSF)'s Division of Earth Sciences, which funded the research. One of the most important volcanic gases is sulfur dioxide. It is oxidized in the atmosphere and turned to sulfate aerosol. This aerosol plays an important role in climate change. "The volcanic eruptions of the last several thousand years hardly compare with some of the eruptions in the past 40 million years in western North America, especially in the amount of sulfur dioxide those eruptions spewed out," says Bao. What's more important, he says, is that the formation of sulfate aerosol is related to atmospheric conditions at the time of a volcano's eruption. In the Nature paper, he and colleagues show that past sulfate aerosol formed in a different way than it does today, indicating a change from atmospheric conditions then to now. A similar volcanic event to the long-ago past likely will happen again, Bao says: in the next Yellowstone eruption. The closest analog, Bao believes, is the 1783 Laki, Iceland, eruption and the subsequent "dry fogs" in continental Europe. That event devastated Iceland's cattle population. People with lung problems suffered the worst, he says. In North America, the very next year's winter, that of 1784, was the longest and one of the coldest on record. The Mississippi River froze as far south as New Orleans. The French Revolution in 1789 may have been triggered by the poverty and famine caused by the eruption, scientists believe. "Millions of years ago, volcanic eruptions in North America were more explosive," Bao says, "and the quantity of sulfur dioxide released was probably hundreds of times more--greater even than in Laki in 1783."